Best turntables to buy in 2015 | What Hi-Fi? Looking to get yourself a new turntable? We've rounded up some of the best record players on the market right now – from budget options right up to high-end products, there's a turntable to suit all tastes, needs and wallets. The following are the best value turntables, from decks under £200, under £500 and a few if money is no object (one of which is arguably the best turntable we've ever heard). The Pro-Ject Elemental is one of the most basic and easy to set-up turntables we've ever come across. But that doesn't mean it doesn't deliver. 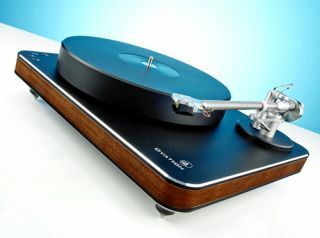 This is a very talented, and capable turntable with good build quality for the price. It's the best budget turntable on the market. The Pro-Ject Essential II won our 2013 award for 'Best Turntable up to £400', and it's clear why. Build quality improves over its cheaper sibling as does sound quality. It's well worth the extra £50 if your budget can stretch to it. Like the Pro-Ject Elemental, this Rega takes turntables back to their basics; a plinth, rubber feet, main-bearing RB 101 arm, a motor and a pulley. All that (relative) simplicity delivers an astonishingly good sound. It may have won an award way back in 2010, but the RP1 is still able to hold its own against the budget Pro-Jects in this list. The Rega RP3 was our Product of the Year in 2013 and 2014. We love how easy it is to set-up and use. It sounds fantastic for the money and can handle most musical styles. High-quality parts sit alongside an attractive design, so if your budget can stretch this far, there's little else that can beat it. No matter what amplifier and speaker combination this Pro-ject is partnered with, the results are impressive. It's able to dig up serious amounts of detail with expert precision. It's carbon fibre arm adds some exclusivity to it too, as not many decks - even more expensive ones - use the material. It's hard to find fault with the 1 Xpression Carbon UKX and therefore warrants your attention. You'd be forgiven for thinking we're biased toward Pro-Ject turntables. But time and time again we find the company's turntables deliver the goods. The 2-Xperience Basic+ is no different. This is a well-controlled turntable that delivers "oodles of detail." A fine-buy. We've long been fans of Clearaudio's Concept turntable package. It's always been well made and easy to use, but a recent price drop puts it back on the front line as far as £1000 turntables are concerned. Clearaudio has also taken the chance to improve the arm recently too. The result is an outstanding product that took the title of Best turntable £800+, Awards 2014. Another award winner for Rega, the RP6 is worth the extra money over its younger RP3 brother. Speed stability is improved thanks to a glass platter, while Rega's usual high build quality and simple set-up are again positiives. Another award-winner from four years ago, the Roksan Radius 5.2 features several minor changes over the Radius 5: an upgraded power supply and Niva unipivot tone arm for instance. The changes add up to be an overall better performer. Detail is dug up by the bucketload and is reproduced in a cohesive and highly musical manner. A lid to keep dust away would be nice though. The RP8 is the most ambitious Rega turntable we’ve ever tested. Initially, it’s possible to confuse it for one of the company’s more modest offerings, but a closer look reveals there’s far more going on here than first impressions suggest. And we’re not talking about the gloss-black finish, either. The Majik LP12 is highly reminiscent of the iconic LP12; the Majik benefits from the same plinth, bearing and suspension. Costs have been cut elsewhere to bring the price down to a more affordable level (it's all relative). Once set-up (we recommend letting the dealer do this) the Majik LP12 delivers plenty of authority. It also remains a very composed deck, with few other turntables able to compete. The Majik LP12 is a great way to own a piece of the LP12 legend. The Ovation is another fine Clearaudio turntable. It boasts exceptional build quality and features a Panzerholz layer (bullet-proof, apparently), sandwiched between two plates of aluminium. This is an extremely capable deck with plenty of drive. It's fuss-free when it comes to genre, meaning you can throw anything at it, knowing it will sound great. The Innovation Wood is an incredibly well-built turntable with plenty of innovation – as the name suggests, and as you'd rightly expect for this sort of money. As with the majority of turntables, this requires careful placement: on a rigid support, far away from the speakers. Coupled with Clearaudio's Universal arm and Da-Vinci V2 high-end cartridge, the Innovation Wood manages to unturf every single piece of information from the record. Thirteen thousand pounds is a lot of money, but if you're a lover of vinyl and have the money, this is a brilliant piece of engineering.